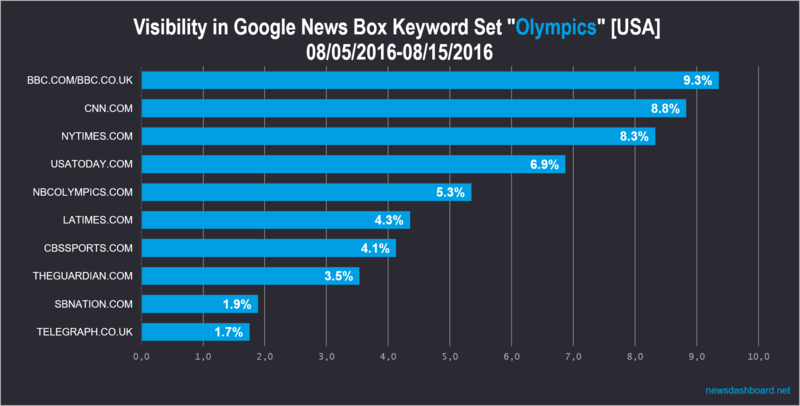 Half-time at the Olympics – which news publisher wins most of the US Google News Boxes? Half of the Olympic Games in Rio are already over – and it is about time to draw up an interim result. The USA are by far the most successful nation and were able to win the highest number of medals. But which US news publishers were able to benefit from the American athletes’ success? Who has the highest visibility in the Desktop Google News Boxes? 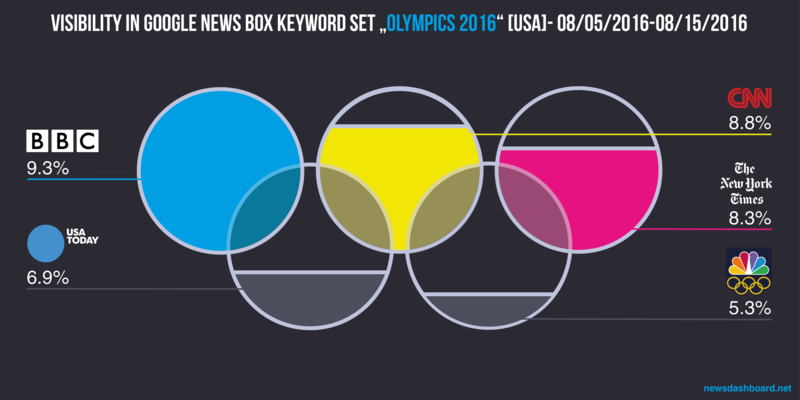 For the following analysis, we created a set of keywords around the Olympic Games (you will find a list of the keywords at the end of this text) and analysed the corresponding News Boxes. We chose 5th August – the day of the opening ceremony – until 15th August as our time frame. Before looking at the data created by the Trisolute News Dashboard, we cast a glance at Google Search results page around the olympics itself. As the following screenshot shows, Google has developed a special information chart for the Olympic Games. It can be found at the top of the SERP (Search Engine Result Page) and contains information for the corresponding keyword (in this case: Michael Phelps). This leads to the assumption that Google News “withholds” some traffic from the news publishers, because the Google News Boxes with the latest articles for Olympic keywords are further down on the SERP, and the users can get their information straight from Google. Nonetheless will news publishers, which have been placed prominently in the Google News Boxes, have gotten more traffic than those that were rarely able to rank in the News Boxes. The following graph shows the top 10 concerning visibility in the Google News Boxes. It is surprising that bbc.com respectively bbc.co.uk is on place 1 and has thus provided the majority of articles in the Google News Boxes. With a visibility of 9.3 percent, the British BBC is leading before the American news giant cnn.com (8.8 percent visibility) and nytimes.com (8.3 percent). In the medal table, the Americans are beating the British; but a British news site is most successful in the Google News Boxes. It is another surprise that the sports page espn.com is not part of the top 10. Espn.com only reached a visibility of 0.7 percent. In past analyses for sports events, espn.go.com was mostly leading the Google News Boxes with a visibility of sometimes more than 20 percent (cf. e.g. the analyses for the NBA ). So 0.7 percent is vanishingly small. One reason for the relatively low result of the page could be the change of their URL: ESPN changed their URL from espn.go.com into espn.com beginning of August. But other news publishers were able to prevail in the top ten: for example nbcolympics.com, a page dealing with the Olympics only. Other successful news publishers in the Google News Boxes are, for example, usatoday.com, latimes.com, and cbssports.com. On the 14th of August, Michael Phelps and three team mates won the 4 x 100 meters medley relay. So at the end of his Olympic career, he is looking back at 23 gold medals, and he is therefore one of the Olympic stars. 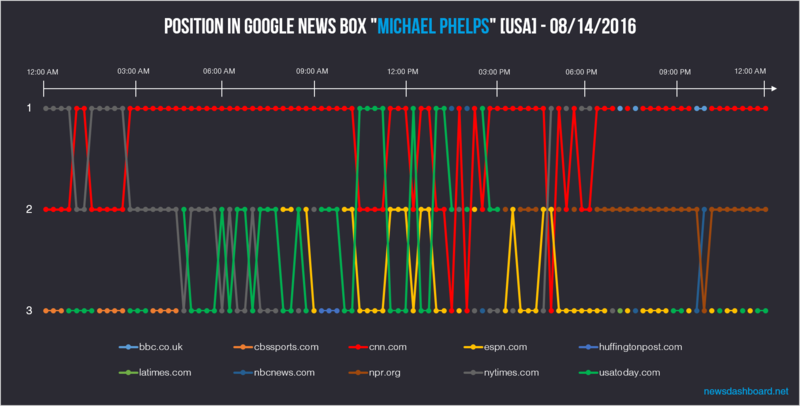 We took a closer look at the Google News Box for the keyword “Michael Phelps” on the 14th of August. Cnn.com was on one of the first and therefore most wanted places of the Google News Box almost all day. Only temporarily were nytimes.com, usatoday.com, nbcnews.com and bbc.co.uk able to win the first position. 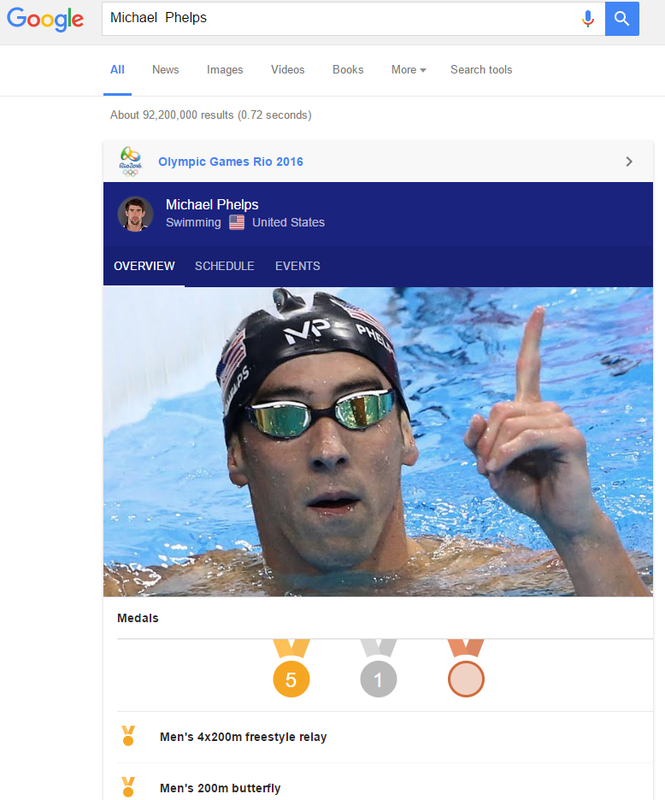 On the second place of the Michael Phelps Google News Box were, amongst others, nytimes.com, usatoday.com, and npr.org. Espn.com ranked in the Google News Box as well at times, for example at 10 a.m. and 12 p.m. on position 2, and between 5 p.m. and 11 p.m. with less interruptions on position 3.
cnn.com is on the first position of the Google News Box for Michael Phelps most of the time. In summary it can be said, that there were quite a few surprises concerning the visibility in the US Google News Boxes for the Olympics. In the overall period under review, the British page bbc.com / bbc.co.uk com ranked most often in the Google News Boxes before cnn.com and nytimes.com. It is also surprising that the sports page espn.com was almost not present in the Google News Boxes. In the overall period under review, the page only reached a visibility of 0.7 percent. 2016 summer olympics opening ceremony, adam peaty, andy murray, basketball, brady ellison, coach k, corey cogdell, dream team, gabby douglas, gymnastics, ioc, julija elfimova, katie ledecky, medal standings, olympic games, olympic games 2016, olympics, olympics 2016, olympics athletics, olympics favorites, olympics gymnastics, olympics live, olympics live stream, olympics news, olympics results, olympics rio, olympics rio 2016, olympics swimming, opening ceremony, rio, rio 2016, rio olympics, ryan lochte, serena williams, summer olympics, swimming, team usa, usain bolt, venus williams, volleyball.